Cozy Chicks: DON'T FORGET YOUR GREENS! I'm trying a lot of new "whole foods" recipes and I thought I'd start with greens. 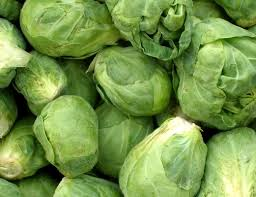 Brussel sprouts, for starters. I've been cooking them in a really uninspired way--halving them and boiling them with a bit of salt, and then topping them with butter. 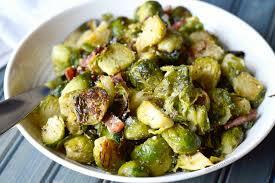 But I discovered a better way--roasted brussel sprouts! Here's all you need to do. Get a large plastic bag and toss in these ingredients. Give them a good shake and spread them on a baking sheet that's been sprayed with PAM. Now roast at 425 degrees for 15-17 minutes. What could be easier? Hope you try it and stay tuned for more interesting takes on veggies. Note: the brussel sprouts pictured above are topped with a little cooked crumbled bacon, but I make the vegetarian version.